For Prelims: Features and significance of the Bill, Private Member’s bill- key facts. For Mains: Significance and the need for the bill, issues related and potential of private members’ bills. 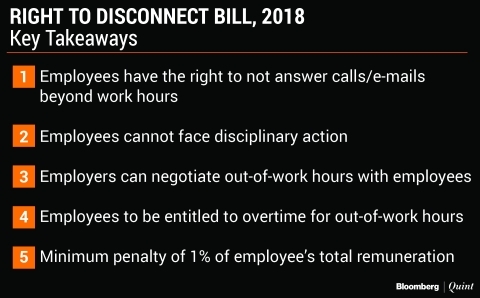 Context: To help employees strike a better work-life balance and reduce stress, NCP MP Supriya Sule has introduced the Right to Disconnect Bill 2018, a Private Member’s Bill, in the Lok Sabha. The Bill requires the setting up of an Employee Welfare Authority, which will publish reports related to the impact employees have from prolonged use of digital tools beyond office hours and it will also create a charter defining employee-employer negotiation. With dynamic business demands in an evolving corporate landscape, striking a work-life balance has become difficult but also a priority. The imbalance leads to stress, anxiety and sleep deprivation—notable trends in studies on employee health. The traditional service sector has to often deal with unreasonable work hours, working overtime without extra compensation, or carrying their work home. The insidious impact of ‘always on’ organizational culture is often unaccounted for or disguised as a benefit – increased convenience, for example, or higher autonomy and control over work-life boundaries. After being in the workplace for eight hours or more, it might be very stressful for a person to respond to office-related calls after work. According to experts, work-related stress can often lead to a lot of physical and mental ailments including depression, which might go undiagnosed. As a result of which, a person might face a lot of problem in his professional and personal life as well. The Right to Disconnect Bill 2018, if passed, will help people strike work-life balance and lead a better life. The bill is yet to be discussed in the Lok Sabha. The odds however are stacked against the bill’s discussion. Data reveals that fewer than 5% of private bills are even debated in Lok Sabha. According to research from PRS Legislative published in 2015, the 13th Lok Sabha discussed barely 5% of private bills, the 14th Lok Sabha discussed 3%, while the 16th Lok Sabha discussed only 2.85% of private bills. Mains Question: “The concept of private members’ bill is central to a deliberative democracy.” Discuss in the Indian context.